First, create your shirt design. I designed my shirt using Microsoft Word. Instead of using numbers to check my length, I'm using shapes. I figured that shapes would be easier to cut out with the X-Acto knife than numbers. Also, I made the lines thick in order to make an easier cut and for a more defined look. Once my design was the way I wanted it to be, I printed it out. If you want to use my design, click the link below for a free PDF Version. For the next step, you'll need your pencil, X-Acto knife, design printout, and clipboard (anything sturdy to cut on like cardboard would be perfect as well). 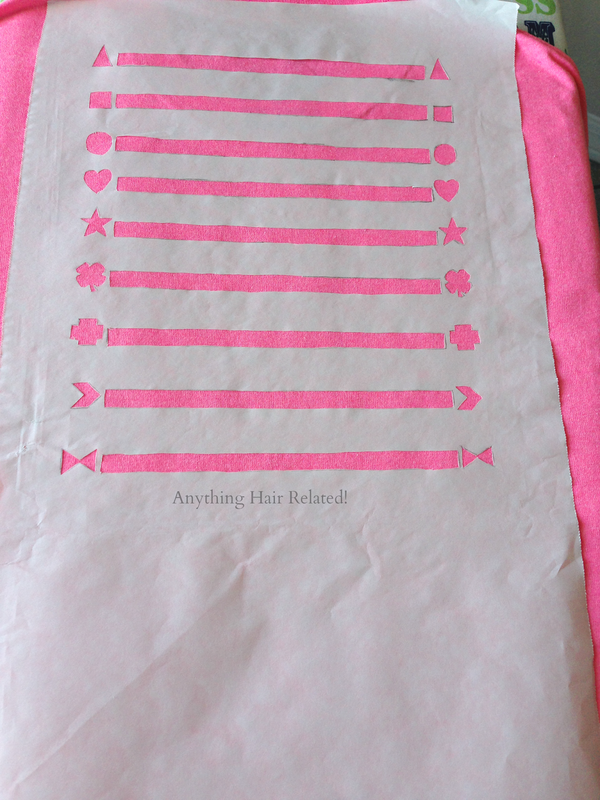 Take a sheet of freezer paper that is long enough to cover your entire design. Lay the freezer paper on top of your design making sure that the glossy side is FACED DOWN. You should be able to see your design through the freezer paper. 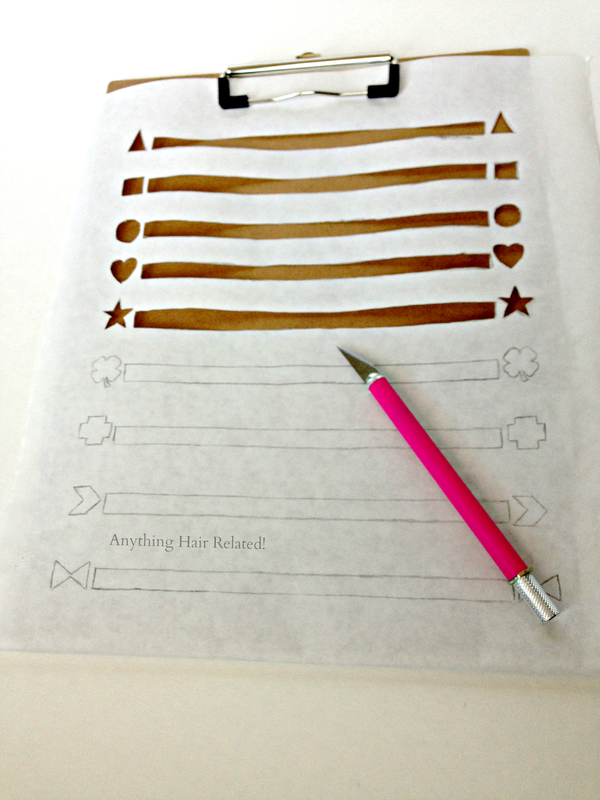 Using your pencil, trace your design onto the freezer paper. 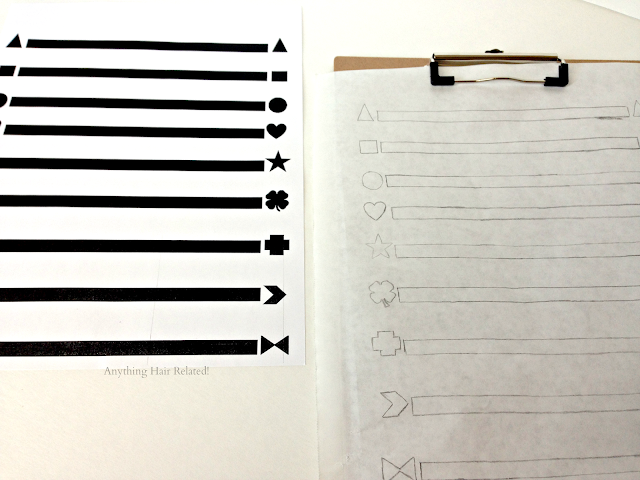 Once you're done with tracing, remove your design printout and store it so you can use it again another time. Now it's time to create your stencil. Place your freezer paper on top of your clipboard and secure it. Take your X-Acto Knife and begin to cut along the lines that you traced. Cut carefully and precisely. Once you're done, it's time to iron your stencil onto your shirt. Take your iron, turn it on, and make sure that the steam setting is turned OFF! Next, place your freezer paper (with the glossy side down) onto the shirt where you want your design to be. I wanted my design to be as close to the collar of the shirt as possible and I also wanted it on the back of the shirt to check my length. Take your iron and begin ironing over the stencil for about 2 minutes. This step will allow the glossy portion of the freezer paper to stick to the shirt. There should not be any raised pieces of freezer paper on the shirt or paint will seep through. Once the shirt is cool to the touch, it's time to begin painting! 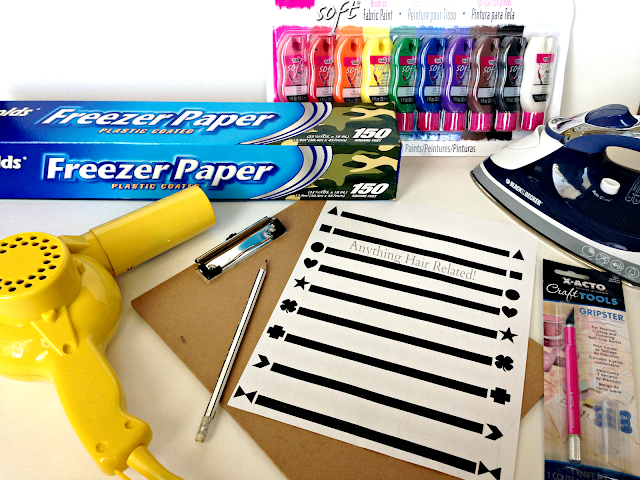 Take the fabric paint of your choice and squirt some on a scrap piece of freezer paper. Next, place your clipboard inside of the shirt. This will prevent the paint from seeping through the portion of the shirt you are working on. 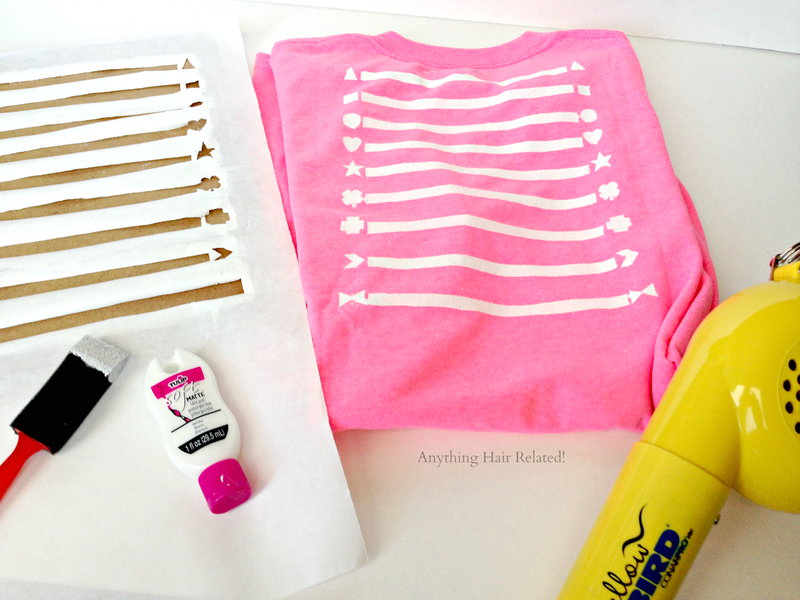 Use your sponge brush to dab paint onto your stencil covering the cutout spots. Dab a second coat of paint for a more opaque look. Next, take your blow dryer and blow dry the paint for about five minutes. Next, carefully peel off the freezer paper and reveal your masterpiece. The paint will still be wet but it will be dry enough to pull off the freezer paper. Let the shirt completely dry by laying it flat for 6 hours. This is after I pulled off the freezer paper. I forgot to take a photo of what it looked like after painting. The finished product is neat and crisp. Your shirt will be machine washable after 3 days. This is a great project to do with your girlfriends or to give as a gift. In total, I spent about $30 on this project. 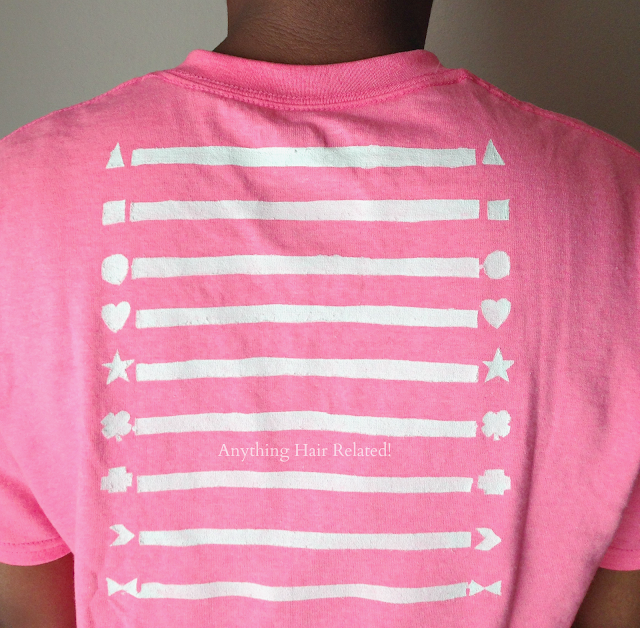 However, I can make more shirts for a fraction of the cost because I already have the materials. 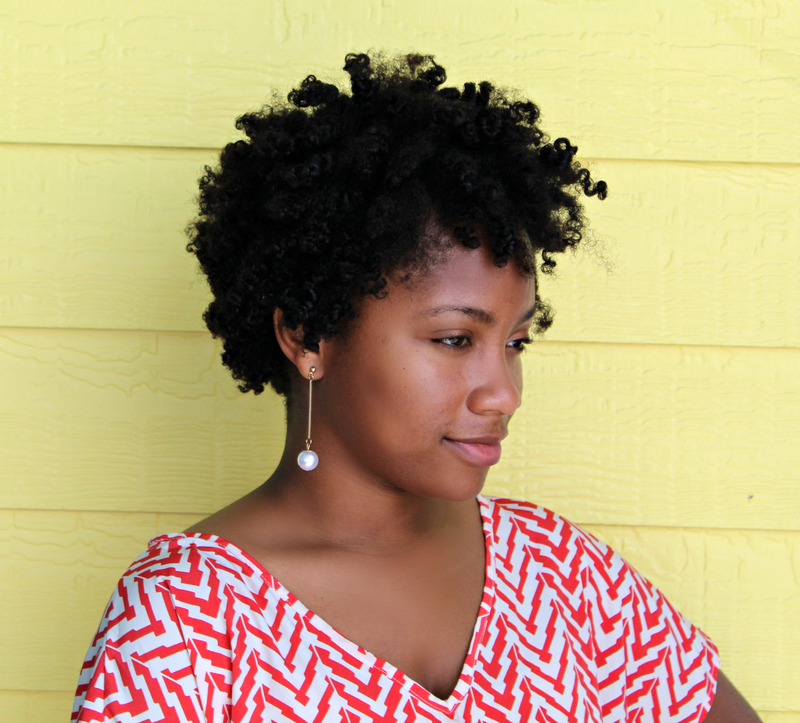 You can get creative and make a length check design for the front of the shirt; to check your length in the front. I decided to put a picture on the front of my shirt and I used the same technique. The possibilities are endless. 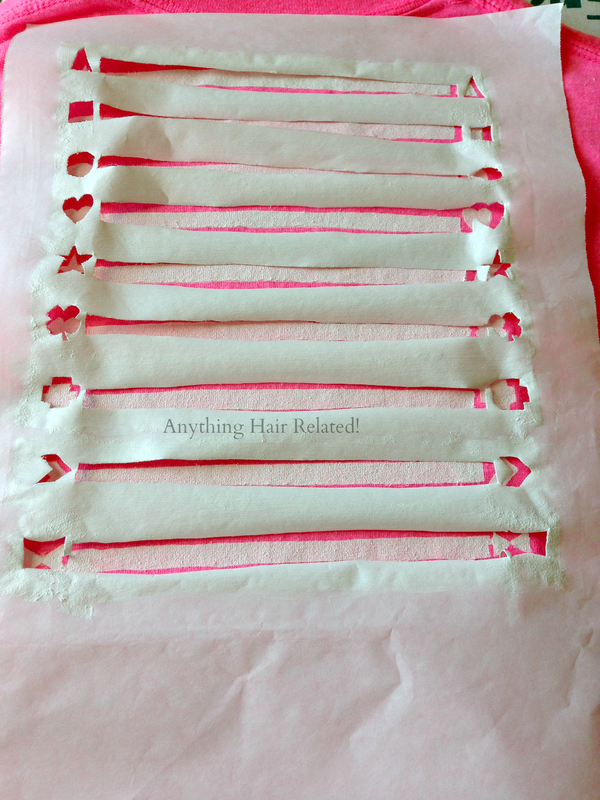 2 comments on "DIY Length Check Shirt | Free Printable"